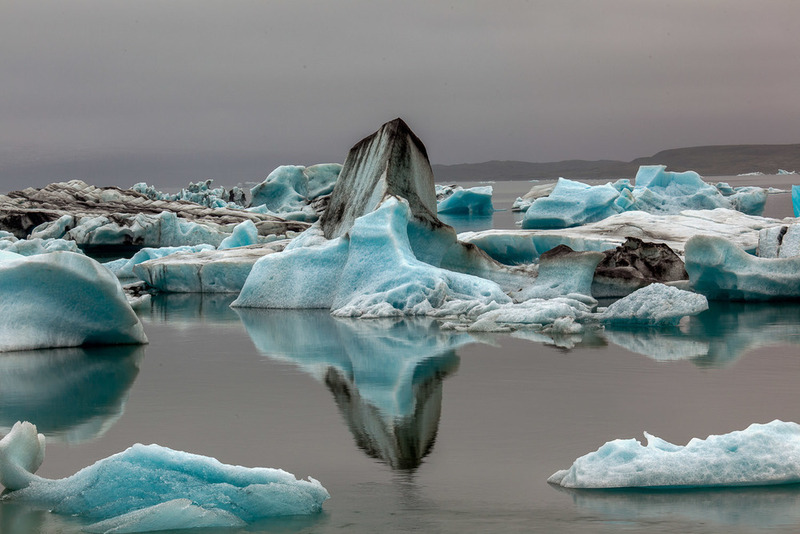 Jökulsárlón Glacier Lagoon is an amazing place and one of the most visited and most photographed places in Iceland. Large icebergs create stunning formations and a beautiful reflection on the Jokulsarlon Glacier Lagoon in Iceland. Simply standing on the bank, by the water’s edge, will provide you with great photo opportunities. There’s just so much going on as the light changes throughout the day and the icebergs make their journey from the nearby glacier, across the lagoon, to the sea about a kilometer away. The lagoon is set amongst stunning mountains and is backed by the massive Breiðamerkurjökull glacier. 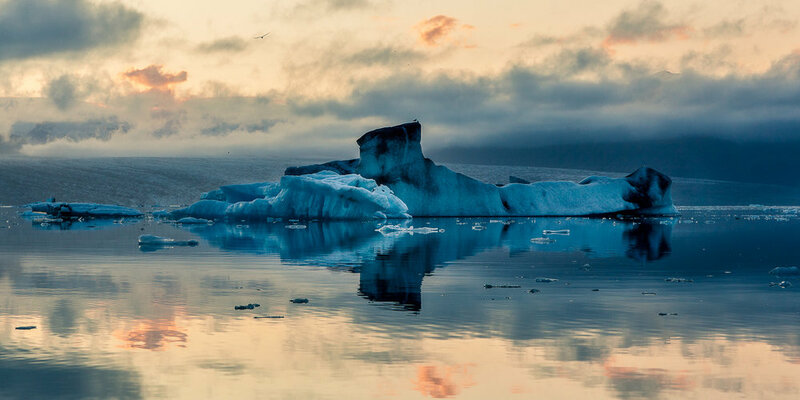 The gorgeous turquoise and teal colors of the water and icebergs are a spectacular sight and will likely be one of your most vivid memories from your trip to Iceland. But to adequately photograph a location you sometimes need to return at several times of the day and photograph from different perspectives. 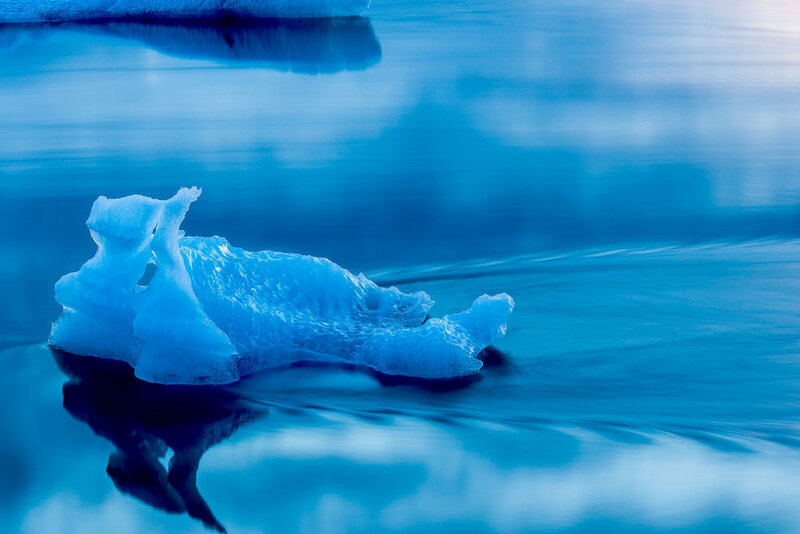 This is certainly true for Jökulsárlón because, as well as making photos from various places along the edge of the lagoon, it’s possible to take a zodiac cruise on the waters of the lagoon. The zodiac cruise gets you nice and close to some of the icebergs and allows you to photograph them from a variety of angles on your quest for a compelling image. A lone iceberg, having broken off the Breiòamerkurjökull Glacier, skims across the surface of the water on Jökúlsárlon Glacier Lagoon on its way to the sea off the southern coast of Iceland. Front lighting is great for revealing color in the object photographed. Side lighting is ideal for emphasizing shape and texture. Back lighting can create a silhouette or, when the ice is thin, can reveal the liquid and color qualities of the ice. It’s a little like photographing stained glass. The glacial lagoon is a compelling location and really should be visited at different times of the day. For many folks, it will be a once in a life time experience, and being properly prepared will make all the difference when it comes to making great photos. A beautiful glow at sunset illuminated the sky and water with a myriad of colors at Jokulsarlon Glacier Lagoon in Iceland. If you’re a serious landscape photographer you’ll likely have a tripod with you for long exposure work at the edges of the day and when you’re looking to make beautiful images that explore movement and the passage of time within a still image. Under brighter, higher contrast conditions a tripod is a necessary piece of kit as part of a HDR workflow. My recommendation is to stay nearby and photograph Jökulsárlón Glacier Lagoon several times throughout the day. If you have a van you’ll be able to take a nap during the day or if the weather turns inclement. 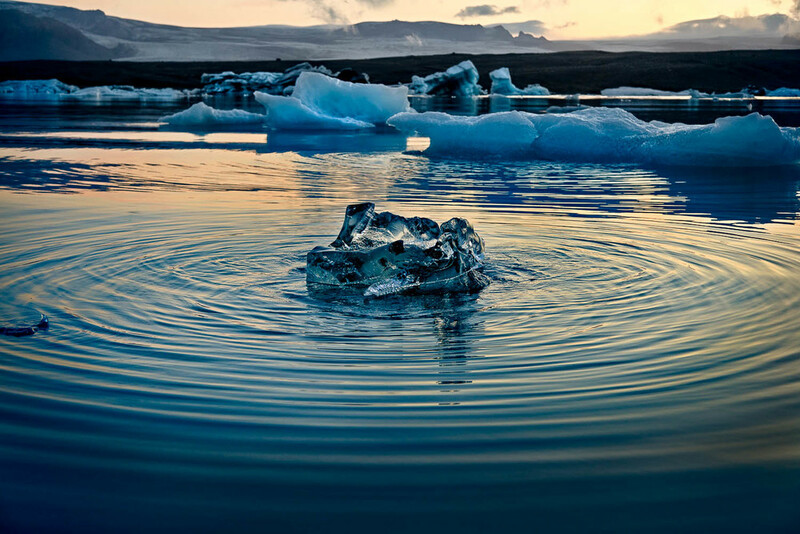 Iceland is one of the world’s great photography destinations. Its relative isolation and low population make it a mecca for landscape photography. I’ve had the good fortune to travel to Iceland on two occasions, including my Iceland Photography Tour I conducted back in 2016. There’s no doubt facilities have improved dramatically since my first visit in 2011. There’s good accommodation and food available around much of the island. However, landscape photograph doesn’t often fit in with normal meal times. You need to be organized with spare clothing, including socks and shoes, and bring meals and snacks with you on a long day out. There’s just so much to see and do but, because roads aren’t always good, don’t underestimate the importance of a well planned itinerary, that still leaves time for unplanned exploration. Most important of all ensure your accommodation is booked well in advance. Many towns a little more than hamlets and sleeping in a small car is no fun in any part of the world. I’m really looking forward to my next visit. Perhaps we’ll journey there together.